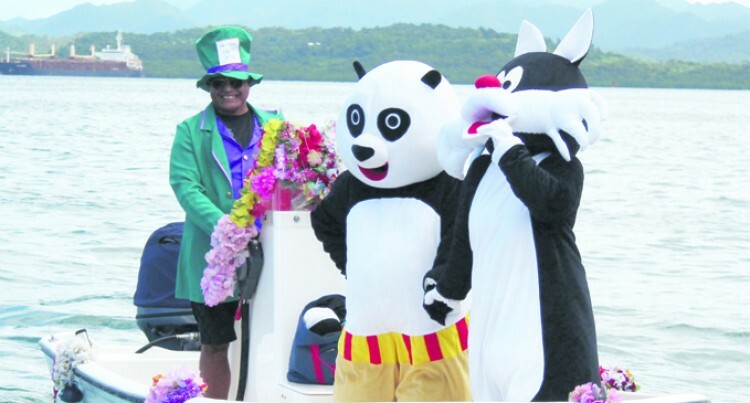 Members of the Suva Yacht Club dressed in Dizney World Characters as Sylvester the Cat, Kung-Fu Panda and Charlie from the Charlie and the Chocolate Factory at the Sailed Pass on 5th May 2018. Photo: SIMIONE HARAVANUA. Father Iowane Gukibau yesterday blessed 30 boats to mark the start of the sailing season for the Royal Suva Yacht Club. Children of sailors, dressed in different costumes, sailed from the Yacht Club to the Suva harbour in their mini-yachts, accom­panying the big boats and yachts. The Commodore of the Yacht Club Peter Watts said the blessing of the yachts and boats was an annual tradition of the Yacht Club since 1932 when the club was estab­lished. He said the blessing ceremony was impor­tant for the boats and sailors because they believed it would keep them safe at sea for the rest of the year. “The start of the non-cyclone season is the start of our sailing season,” he said. “The process is to bless the fleet. “Because it’s the end of the cyclone season and the start of our recreational season, the fishing guys and the sailors and everyone who take part are blessed during the start of the year for the Yacht Club. “We had 30 boats out in the sea to be blessed which was a lot more than the last year. It is also about the club members to get together and have a good time,” Commodore Watts said. One of the yachts blessed during the cer­emony was Deepa III owned by Patricia Punja, wife of a prominent businessman Rohit Punja. She said they had been a part of the club for the last 26 years and were privileged to be blessed by the priest. “We had the group from Oceania Dance Theatre with us to dance on our yacht.“They have taken part with us since last year.